In this brief interview on Radio InBlu, I summerise some of the most current topics both for Italy and for other International partners. Trump and China, tariffs, European Union and Italian political elections with the newly elected government. Here’s my point of view. In the last few months there has been an escalation between the US and China, with its nadir last month, and then they turned the volume down during these last weeks. China has lowered tariffs as well as the United States. It is often a parable, we start from zero then there’s an escalation, often media-driven, lastly, everything returns to normal. This is because it’s not in Trump’s interest to reduce the trade deficit towards China, which reached its record of $370bn but to protect the weakest and poorest segment of the American population. The dilemma, that is being discussed, is about the economic liberalism of the global market, which can bring some benefits on average, but within this average, there are also losers and Trump wants to defend them. 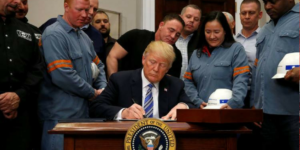 Trump also said, on the eve of the introduction of tariffs, that this is the first step of its policies program. Now we have to understand how the EU will react because there could be a further crackdown. What could be the best strategy for the Union, at this time? I am a bit negative because the EU will face an almost impossible challenge. If it believes in the free market it should not impose tariffs. Unless this is a negotiating move. The most serious thing is that it is impossible to have a European commercial policy of common interest to all 28 countries because each country exports different goods in different quantities and at different prices to different parts of the world. So, it is clear that having the same tariffs vis-à-vis third countries, as happens with other common European policies, we try to take the average, but maybe we also risk to do not content anybody. We also know that those who make the strongest voice can pull water to their mill. For example, as regards steel, Germany would suffer more than other countries because of US tariffs, as it exports more steel than other EU countries. I, therefore, believe that for this reason too, this news was covered more by media than others. China has common tariffs on all products that are exported from the European Union to China. 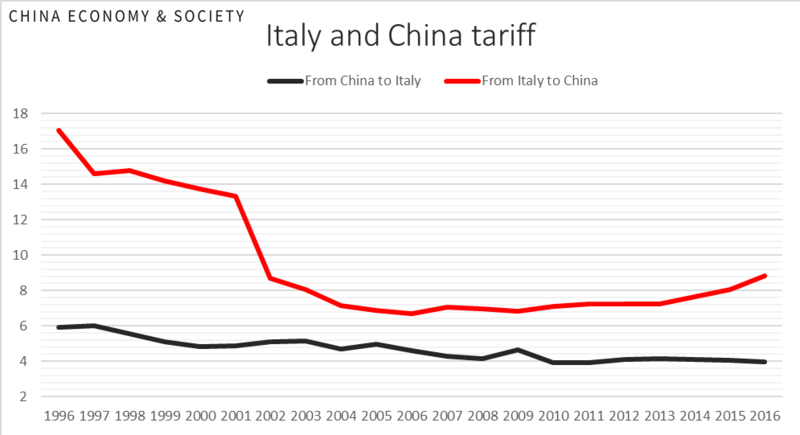 The thing is that Italy, due to the fact that it exports a different type of goods compared to other countries, undergoes a gradual increase in tariffs on its goods. As Italy exports goods that have high nominal tariffs, if compared to other products, the weighted average means that from 2006 until today Italy has suffered an increase in effective duties over time, from 6% to 8%. Although China has been lowering nominal tariffs, however, it was on other European countries exported goods. The new Economy Minister, Giovanni Tria, is considered a friend of the Chinese, is it good for Italy? Yes, this is a good news and I am pleased that in recent years our country’s attention towards China has increased. Tria has often come to China, which makes us suppose interest, which is good. Prof. Moavero Milanesi (current Minister of Foreign Affairs) was also in Shanghai, at a conference organized by me in collaboration with Luiss University. So, let’s say that is a good thing, also because I have always sustained that we are a bit narrow-minded and that we are only concerned with dividing the constituencies to get 0.1% and then these choices are in vain, if we do not take into account the commercial policy, especially that of China, which I believe is the most important variable in this new legislature. I am also pleased that foreign policy goes hand in hand with internal politics, otherwise nothing will be achieved. Draw inspiration from China, which we should try to imitate its good aspects. Therefore, finally today we start in a good way by paying more attention to this important country. I hope this attention will also turn into a growing role in Brussels and Berlin as well. Because I think it is not yet clear, what kind of foreign policy does Italy adopt towards Germany? Is there one? I do not think so. We should raise our voice across different levels, even in Brussels, where we have to be more involved in the issue of tariffs. These tariffs require our government to come up with an important work plan and, as you already said, it is not just a problem of the economic Ministry, because it is obvious that certain plans are intertwined together with other ministries, as they represent our main policy, thus crossing several bureaus and different fronts. Professor, in these days, is China looking with interest to what has been happening in Italy? I know that you are often asked by Chinese colleagues to comment on the Italian situation … By looking to Italy, to the recent government crisis and to this new government, which even after 88 was still struggling… were Chinese confident? Or would they fear for Italy barking up the wrong tree? I don’t think so. Of course, I was involved because it is a breaking news and I’m one of the few Italians, who is often invited on state-owned TV, to talk about issues that affect Italy too. 2) Italy is seen as an important country, but the Chinese focus is on Europe, which is perceived as important by China. The EU has a population that counts for 5% of the world population. I would rather say that the only serious concern for China is the potential crumbling of the union. This would be bad news for China because it is not convenient at the commercial level, it is more advantageous to have one single partner for all 28 European countries with only one bilateral agreement. For example, Brexit has hurt China because England was a privileged partner for China, as it allowed it to enter into the other 27 countries, exploiting it as a “Trojan horse,” thus, using the weak loop. Hungary is now the country where China invests more in green-field if compared to other European countries, and that is why Hungary is seen as the weakest loop now. When China puts greenfield investments on a silver plate, which means new jobs, not exactly the same situation for Italy where China mainly did acquisitions, there is an immediate input of new capital and it is natural that the Hungarian government is much more interested in attracting Chinese investments. Merkel, after the blow on the CUCA, has understood that maybe we must be more careful and do not devalue our countries. For this reason, China, in a certain sense, exploits a little this European Union, to its advantage to go and look for the weakest loop and be able to make investments, open a factory and, in this way, bypass the problem of European tariffs (if it opens a company in Hungary with its products directly become Made in EU). These European rules, which are based on a single market, are difficult to manage at this time of intense globalization. On the other hand, the ASEAN model is very different, where goods produced within the 10 member countries are treated without tariffs, whereas goods coming from outside this network do not have a preferential channel in all the member countries.